Netanyahu will agree to reserve a spot for Rabbi Rafi Peretz on the Likud list and even promise him the education portfolio. Sources in the negotiations between the Jewish Home and the National Union parties said on Saturday night they believe the Jewish Home is considering joining the Likud in exchange for realistic spots on the party's Knesset list. 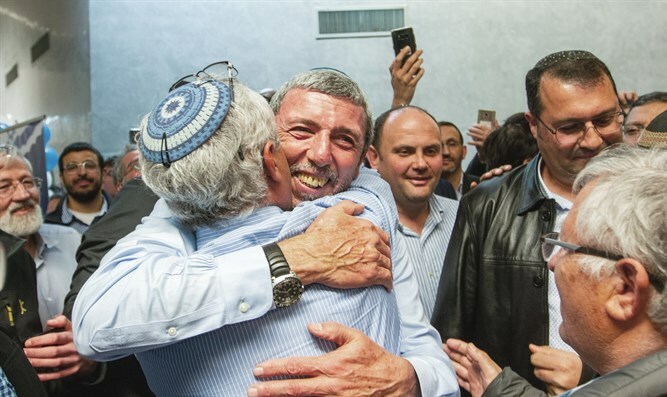 Arutz Sheva has learned that Prime Minister Binyamin Netanyahu will agree to ensure the post of education minister for Rabbi Rafi Peretz, and will place the Jewish Home members in the 21st, 28th and 36th spots on the Likud list. Earlier on Saturday night, negotiations between Jewish Home and the National Union for a joint run in April's elections collapsed. The details of the agreement for a joint run by the National Union and the Jewish Home were finalized on Friday, and the two leaders - Rabbi Peretz and Bezalel Smotrich - met in Jerusalem. Half an hour after the end of Shabbat, Rabbi Peretz called Smotrich and told him that he had consulted with his family and that he could not agree to a joint leadership. "I will be No. 1 and you will be No. 2 with all that this implies. This will play into Naftali Bennett's hands. The Jewish Home must be the flagship," Peretz told Smotrich. Netanyahu asked the Likud Central Committee to reserve two additional spots on the party’s Knesset list - three in all - in order to prepare for alliances in other parties. He wrote in a letter to members of the Likud Central Committee, "I am convinced that this is necessary in order to increase our chances of winning the elections." Sources in the Likud estimated at the time that Netanyahu's request came due to the possibility of unification with another list.